Cathy teaches needle felting classes and workshops in the GTHA area of Southern Ontario. 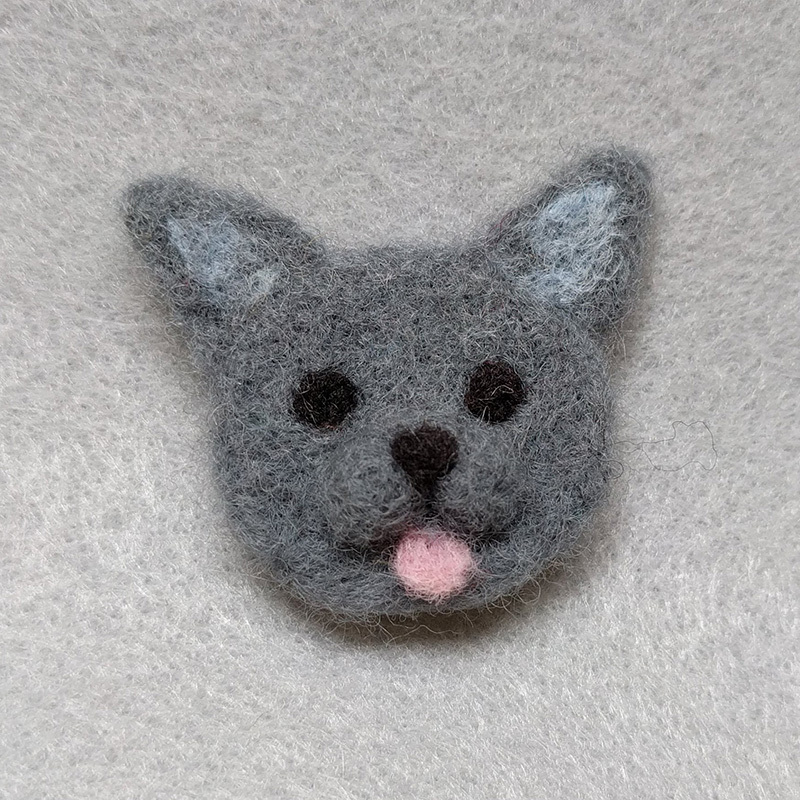 Take a beginner’s course to learn the basics or take your needle felting to the next level and learn some intermediate techniques. Classes and workshops are currently held in various locations in Oakville, Burlington, and Hamilton. Each listing will say where the event is being held and a link for more information where you can sign up. Don’t see a class that fits your time? Spring has sprung! 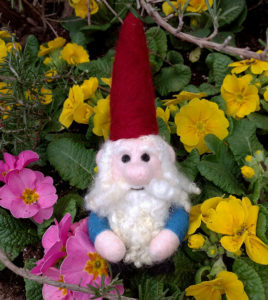 Why not learn to needle felt a whimsical garden gnome to watch over your house plants? Students will learn special techniques to create this mythical creature, like attaching a separate cone hat and applying wool locks for hair. 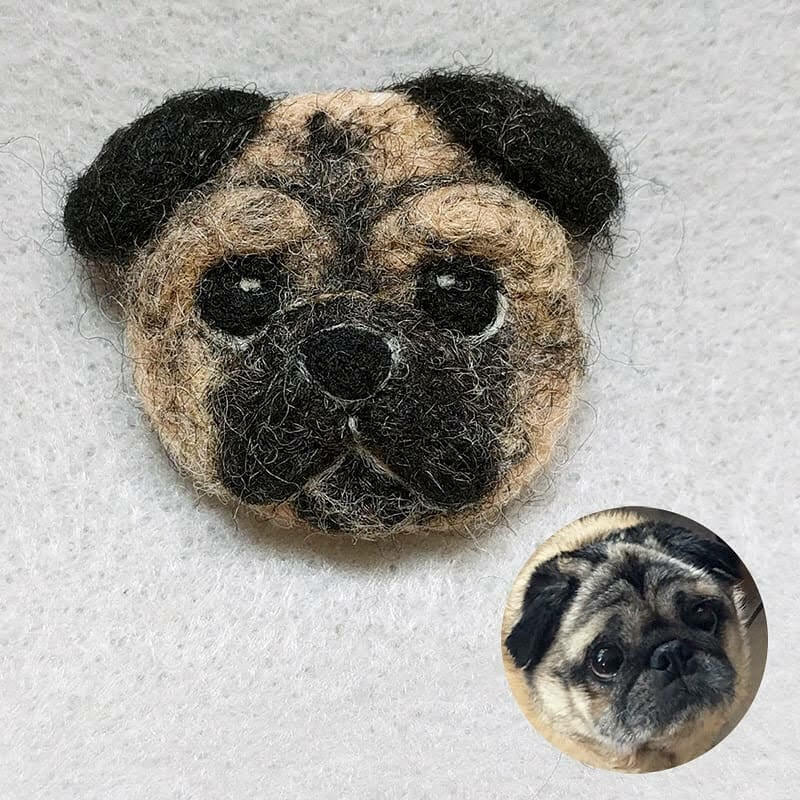 NOTE: This course is for intermediate students who have taken needle felting courses in the past or have lots of practice. 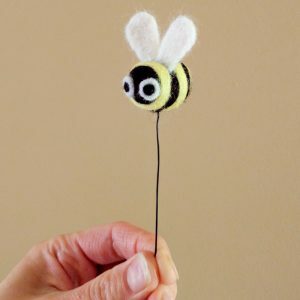 Spring is abuzz and it’s the perfect time to learn to needle felt a cute bee on a wire to decorate your house plants. This class is the day before Mother’s Day so why not treat your Mom to a special early gift. Techniques you’ll learn are wrap wire around wool then wrap wool around that to create the core bee shape, add yellow stripes, bee wings and the cute bulgy eyes. 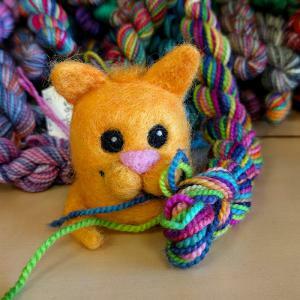 It’s the long weekend so why not take your Mom out for a late Mother’s Day gift to enjoy a fun workshop at a fibre farm. 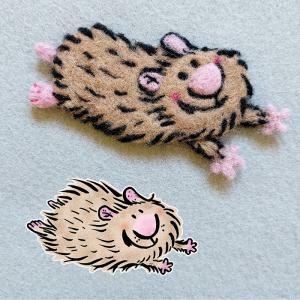 Meet the animals on the farm and learn to needle and wet felt a pair of earrings and a bracelet using the natural colour fibres from the animals raised on the farm. As a special treat, there will be tea and a cone to start, included in the price. Your mom will love the break from gardening! What is a wool “painting”? 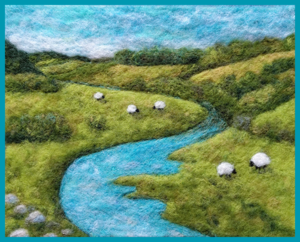 In this workshop, you will learn how to needle felt a landscape onto an 8″ x 10″ pre-felted wool sheet to make a beautiful wool “painting”. 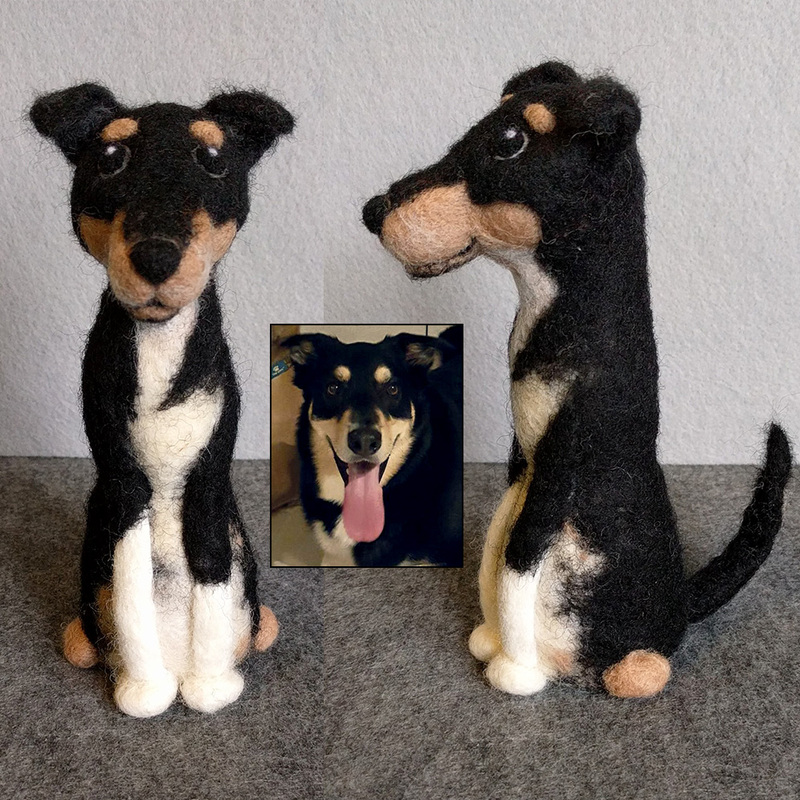 This is a very relaxed project and great to do with friends. All materials are included, and you get to take home the foam pad, needle, all the extra wool in your kit, along with your masterpiece. *NOTE: In order to use the room at Fionn MacCool’s, everyone must order a drink and/or food item. Please arrive earlier if you’d like to eat lunch. Cathy will be there at 11:30 a.m. 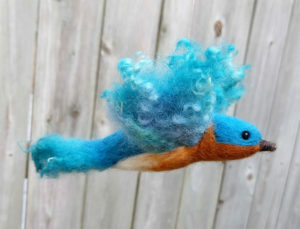 Create a beautiful bluebird using needle felting techniques! Using a pipe cleaner, learn how to create a beak and wrap wool around it to create the core shape. Students will learn to attach wool locks for wings and a nylon cord so you can let your bird sway in the breeze. More Spring workshops are begin planned. Check back often. 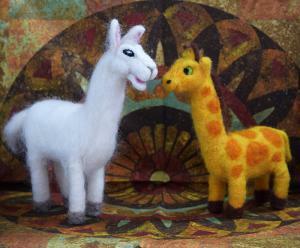 If you have a class idea or something specific you want to needle felt, please let me know: cathy@woollydoodles.com. I am always looking for new ideas.